The 2019 National Science Foundation version of The Grant Application Writer’s Workbook has been updated to reflect the NSF revised version of the Proposal and Award Policies and Procedures Guide (PAPPG) effective for all proposals submitted after January 28, 2019. Here are the principal changes in this edition. To order securely now, click Add to Cart. 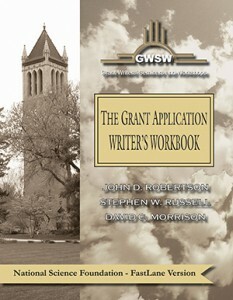 The Grant Application Writer’s Workbook – NSF FastLane Version covers how applications to the National Science Foundation are prepared and reviewed. In this newly updated version, content has been updated to provide guidance and reflect the changes NSF has made. In addition to the updates, there is discussion about the use of the same review criteria for Intellectual Merit and Broader Impacts. Particular emphasis is placed on what constitutes an appropriate Broader Impacts activity. Principles and fundamentals of good proposal writing are also emphasized, together with essential tips and strategies to produce an end result that is clear, concise, and follows a rational progression. Examples are provided in the Workbook, after which you’re asked to make a comparable response in your area of research interest. As each such response is made, the first draft of your application evolves. You may sample the content of this Workbook by clicking on the links to the right. Give yourself a competitive advantage when you write your next proposal to the NSF by investing in the latest updated iteration of The Grant Application Writer’s Workbook – NSF FastLane Version, available for purchase today!